Fun fact about this card’s name and concept: archaeologists have found a surprising number of sarcophagi in our version of Egypt (the one that wasn’t ruled by Nicol Bolas) which were empty. It’s not really known whether somebody got there before them, or if the person was re-buried in ancient times, but it is very curious. 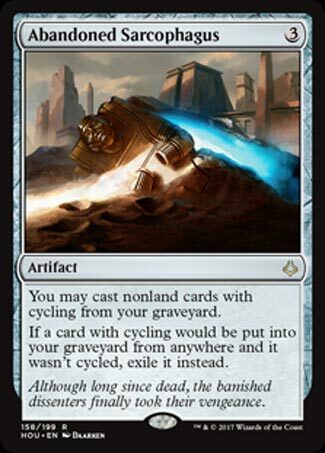 Cycling is all about giving you extra things to do with their cards, and Abandoned Sarcophagus means that you don’t have to forgo casting the card just because you wanted to cycle it. Given the sometimes major difference between a card’s cycling activation and its mana cost, this will sometimes take quite a long time to work out, and it specifies the order you have to use the abilities in. That’s a pretty narrow niche, but lower-pressure casual environments might be able to make something of it. For me, Cycling reminds me Morph. They are both old mechanics that keep on coming back because they have lots of design space. They are fun in a draft environment but are hard to build a constructed deck 100% dedicated to abusing the mechanic. It’s nice that Abandoned Sarcophagus is an artifact allowing it to fit into any deck you want. I would imagine most of the time you want to play this card with Drake Haven or a Grixis “Hellbent” deck. Unfortunately this card specifies that you can’t return the Bi-Cycle lands so you can’t abuse Fetid Pools or Canyon Slough. Abandoned Sarcophagus looks like, at least in theory, the last piece to the cycling deck in Standard. No longer do you have to choose between cycling or casting…you get both, as long as you cycle first. Abandoned Sarcophagus also is good late as a way to turn back on the cycling cards that made their way to the grave earlier, giving you a chance to cast all of the creatures with cycling that died and recast all the lovely cycling spells. Note that I said “in theory”. Abandoned Sarcophagus is fraught with issues, though; it’s in the weird position of wanting to come out late to maximize value, but it itself does nothing on its own. You permanently lose any cycling cards that you don’t cycle away from that point onward. And…well, it’s an artifact in a format with Abrade and an abundance of efficient artifact removal. While it can be a nice “second wind” for the cycling deck, you would much rather have the major engines of the deck, like Drake Haven and Archfiend of Ifnir. Click here to read over 4,000 more MTG Cards of the Day! Daily Since 2001.